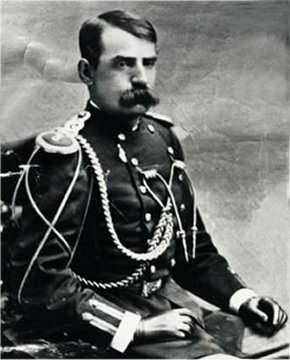 John G. Bourke and his truly heroic mustache. This year we’ve switched from having Anthony enrolled in an online private school to homeschooling him in a more do-it-yourself manner. We’re still using K12’s Grammar and Vocabulary lessons (I bought the full Language Skills package, but I’m ignoring their take on Literature and Composition). That let’s us address some of the kid’s complaints about last year’s packaged education. In particular, he was frustrated by the drive-by approach of many of his subjects–such as Literature dealing with excerpts from brooks rather than whole works, or History lessons that glancingly mentioned interesting topics before passing on to something else. Actually, as much as that sounds like a bad Hollywood script, it is authentic. Bourke wrote in 1892, drawing on his own experience. It turns out that those script-writers weren’t being campy–they were drawing on history (not a shock when you realize that Wyatt Earp, in his later years, was a consultant to the early film industry). Anyway, Bourke was a true scholar (on the board of the Anthropological Society) as well as a participant in the life of the West, and an engaging writer. I strongly recommend his work as an alternative to lifeless modern textbooks.